Juan Cole reported earlier this week on a rumor that Iraqi Prime Minister Nouri al-Maliki might be toppled in a coup. This rumor comes in the midst of intensifying pressure on Maliki from the Bush administration and members of congress. It has been clear for at least a year that Maliki and Bush were headed down different paths. It has also been clear that Mr. Bush’s exit strategy from Iraq rests in part on blaming the Iraqis for the mess that he has created. It is widely expected that the Surgin’ General’s report this September will blame the Iraqis for a lack of political progress while claiming "progress" on the military front. It is reasonable to expect that the new "new way forward" will involve a change at the top of the Iraqi political leadership. The Iraqi leadership derby is on. 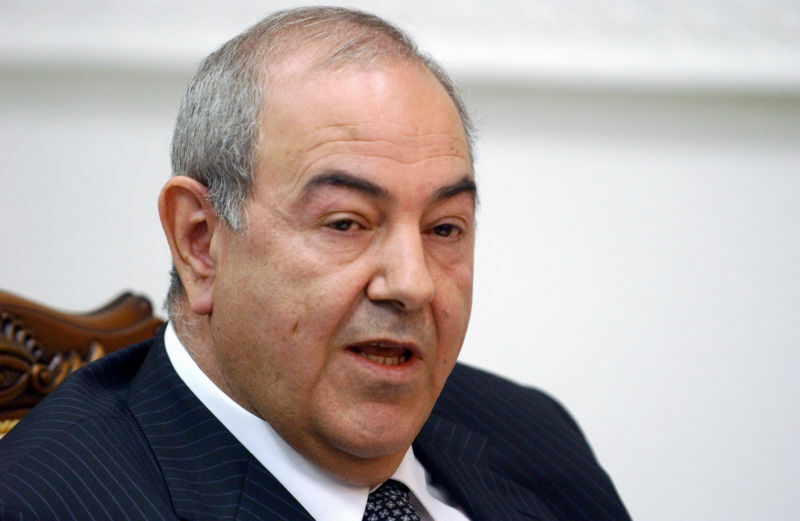 Enter Ayad Allawi – former Baathist, leader of the Iraqi National Accord, CIA asset, former interim Iraqi Prime Minister, and fabulist. Allawi was one half of the Iraqi dynamic duo that helped get this country into the Iraq war; the other half of the duo was CIA asset and Allawi relative Ahmed Chalabi. It was Ayad Allawi who, before the war, passed on the claim that Saddam Hussein could strike Britain with WMD within 45 minutes of an order being given. It was Allawi who found "documentary proof" that Mohammed Atta was trained by Saddam Hussein’s intelligence agencies in Baghdad. Allawi has been tightening the screws on Maliki recently. His party, the Iraqi National List, is resigning from Maliki’s cabinet. He has hired a well-connected Republican lobbying firm in Washington to push his leadership bona fides in Washington. And he has penned a Washington Post op-ed. more than four years after its liberation from Saddam Hussein, Iraq is a failing state, not providing the most basic security and services to its people and contributing to an expanding crisis in the Middle East. Let me be clear. Responsibility for the current mess in Iraq rests primarily with the Iraqi government, not with the United States. Prime Minister Nouri al-Maliki has failed to take advantage of the Iraqi people’s desire for peaceful and productive lives and of the enormous commitment and sacrifices made by the United States and other nations. Who could have imagined that Iraq would be in such crisis more than four years after Saddam Hussein? Each month 2,000 to 3,000 Iraqi civilians are killed by terrorists and sectarian death squads. Electricity and water are available, at best, for only five to six hours a day. Baghdad, once evidence of Iraq’s cultural, ethnic and religious diversity, is now a city of armed sectarian enclaves — much like Beirut of the 1980s. Iraq must be a full partner with the United States in the development of a security plan that leads to the withdrawal of the majority of U.S. forces over the next two years, and that, before then, gradually and substantially reduces the U.S. combat role. I propose declaring a state of emergency for Baghdad and all conflict areas. Iraq’s security forces need to be reconstituted. We need a regional diplomatic strategy that increasingly invests the United Nations and the Arab world in Iraqi security and reconstruction. Washington should not shoulder this diplomatic burden alone, as it largely has until now. Iraq must be a single, independent federal state. We should empower local and provincial institutions at the expense of sectarian politics and an all-powerful and overbearing Baghdad. National reconciliation requires an urgent commitment to moderation and ending sectarian violence by integrating all Iraqis into the political process. The Iraqi economy has been handicapped by corruption and inadequate security. We must emphasize restoration of the most basic infrastructure. It is past time for change at the top of the Iraqi government. Without that, no American military strategy or orderly withdrawal will succeed, and Iraq and the region will be left in chaos. The song Mr. Allawi is singing will appeal to both Democrats and Republicans. He calls for regional diplomacy and gradual withdrawal of American troops, he expresses horror at the current situation in Iraq, and most importantly he absolves Washington of blame and points the finger at Maliki. His message is a focus-group tested lobbying group produced message aimed squarely at American politicians desperately seeking "peace with honor". We must not forget that Allawi has played similar tunes before to tell Washington what it wants to hear in order to get what he wants to get. His fabulous stories before the war played well in Washington. After Saddam was toppled Mr. Allawi hired three lobbying firms (Theros & Theros, Brown Lloyd James, Preston Gates Ellis & Rouvelas Meeds) in Washington, one at a rate of $100,000 per month, to lobby successfully for the Prime Ministership. As the Bush administration beats for the door in Iraq, those Iraqis who helped engineer this war are now lining up to pick up the scraps. Washington would be unwise to buy their fabulous stories again. UPDATE: Today on CNN’s Late Edition Ayad Allawi refused to disclose who is paying the bills for his lobbying efforts. Spencer Ackerman at TPMMuckraker is speculating that Allawi’s defense minister, Hazem Shaalan, may be the person funding his lobbying efforts because he made a bundle while Allawi was in power. However, I think a better candidate would be Mashal Nawab. Nawab is a UK based businessman who is listed in the FARA filings from 2003 as the person who was actually signing the lobbying checks on behalf of Allawi. He was paying the lobbying firms before and he may well be paying them this time around. This entry was posted in Foreign Policy, Iraq, Politics. Bookmark the permalink.